Since this story first aired, Khaliah Shaw has received a million dollars as a settlement from the state. According to her attorney, she is still dealing with a host of problems – like loss of vision and skin issues. Her attorney has also filed lawsuits against the pharmacy and the pharmacist. Those cases are still pending. When 26-year-old Khaliah Shaw looks at pictures of herself from three years ago, she doesn’t recognize that person from before. Before her skin burned from the inside out. Before her sweat glands melted. Before the medically-induced coma. In 2014, Shaw went to a doctor’s office because she felt depressed. She received a prescription for lamotrigine. A pending lawsuit claims Shaw received the wrong dosage, and her pharmacy didn’t catch it. Blisters broke out all over her body. “I was in excruciating pain. It felt like I was on fire,” she said. She was diagnosed with Stevens Johnson Syndrome a rare serious skin disorder. It's usually caused by reaction to a medication or an incorrect dosage. When 26-year-old Khaliah Shaw looks at pictures of herself from three years ago, she doesn’t recognize that person from before. She was diagnosed with Stevens Johnson Syndrome, a rare disorder often created due to a medication error or incorrect dosage. “It essentially causes your body to burn from the inside out and you pretty much just melt,” said Shaw. “This did not have to happen. This was not just some sort of fluke in my opinion. This happened as a directly result of somebody’s error,” said Shaw. The syndrome has left Shaw’s previously flawless skin burned and scarred. She is slowing losing her vision. Her sweat glands are gone, and her finger nails will never grow back. An 11Alive investigation discovered those errors are happening at an alarming rate. According to the Food and Drug and Drug Administration, errors jumped from 16,689 in 2010 to more than 93,930 in 2016. 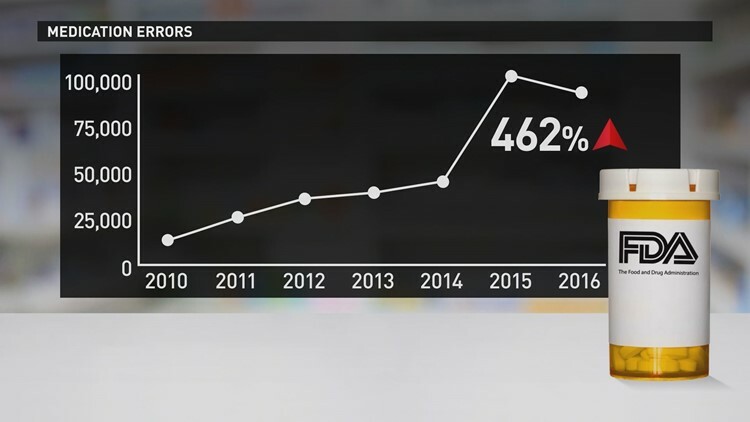 That’s a 462 percent increase. The numbers come from FAERS, or the FDA Adverse Event Reporting System (FAERS), a database that contains information on adverse event and medication error reports submitted to the agency. FAERS is a voluntary reporting system, so the numbers are likely higher. The FDA says the spike is due to improvements made to its reporting system over the past two years. Pharmacy industry experts believe the numbers also reflect more people filling more prescriptions than ever. Medication errors have risen 462% since 2010. Some experts believe there is something Georgia could do to reduce errors. Matt Perri is a pharmacy professor at the University of Georgia. “When pharmacists get busier or pressure gets placed on the pharmacist, it makes it harder for them to do their jobs accurately,” he said. To reduce errors, some states have tried to limit the number of prescriptions a pharmacist can fill to about 150 per shift. Georgia has no limits. Perri isn’t sure what the magic number would be, but he believes there could be benefits in setting limits. Lurey argues training will have a bigger impact. This year, the association published a six-part training series focused on how pharmacists can reduced medication errors. Perri’s advice for patients: make sure you’re consulted by a pharmacist. Georgia law mandates a pharmacist offer consultation when you pick a new prescription. Not a pharmacy tech, but an actual pharmacist. Life after the mistake goes on. 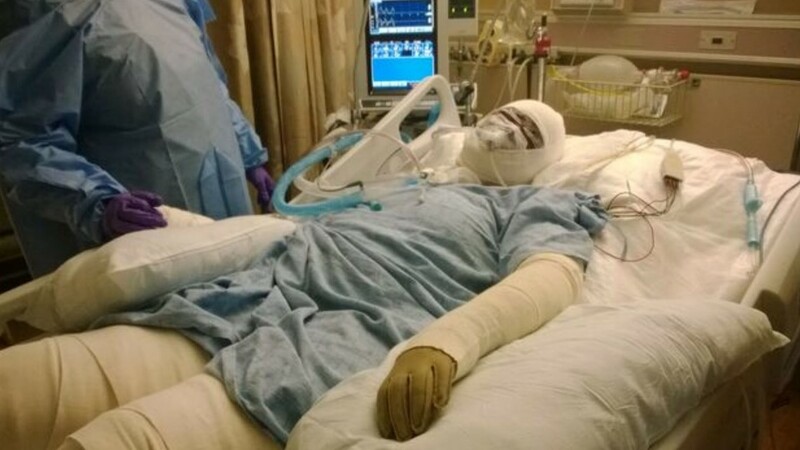 Shaw spent five weeks in medically induced coma while her skin slowly peeled off. There is no cure for Stevens Johnson Syndrome, and she could relapse. “They’re telling me this could happen again, and they’re telling me if it did happen again, that it would be worse,” said Shaw. According to the lawsuit filed on her behalf, medical bills have already reached more than $3.45 million. Extensive and prolonged medical care are expected to continue to add to those bills. Shaw is represented by two attorneys, Trent Speckhals and Robert Roll, both specialize in medication error litigation. “We continue to see the same errors over and over. [They’re] typically the result of pharmacists being too rushed, too busy, filling too many prescriptions and the use of [pharmacy] techs that really don’t have the training and the ability that a pharmacist would," Speckhals said. "That’s one of the sad things, shocking things about it. It continues to happen at an alarming rate." "I never heard of Stevens Johnson Syndrome until I was in the hospital with my skin melting off of my body. That’s when I learned what it was," Shaw said. It's a lesson she says no one should have to learn. "It's important to know what's in your body." "Be an advocate for yourself. Educate before you medicate," she said. "Know what the side effects are."